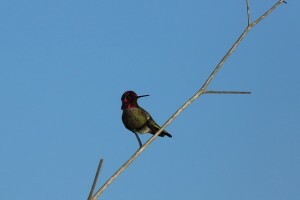 When you do a Creative Commons image search for “toughness,” you get a lot of wordiness and this hummingbird. I like hummingbirds, and this one is apparently hanging out on a very slight branch in heavy wind (at least according to the photographer). I feel a bit like this bird right now. One of my friends told me to “hang tough” a few days ago, and I’m trying my best to do it. In my attempts, I’ve realized one thing: there are different kinds of toughness, and some of them come more easily than others. The kind of toughness I need right now is one of the ones that doesn’t come easily, at least it doesn’t come easily for me. It is the kind of toughness needed to deal with injury, uncertainty, vulnerability. It is a toughness born of patience rather than action. Patience not only to wait for the diagnosis and healing to happen, but also patience to deal with everything else that comes along with not being able to lace up my shoes and burn off my frustrations, no the least of which is all that I do not know about what is wrong with my foot. I have a theory, but I’m a Ph.D. of literary studies, and my foot has little in common with the kind of feet we find in poetry. Here is what I do know: it’s been a little over a week, and I’ve been off my foot for almost that entire time. You do not want to know how many hours of TV I have watched in the last seven days. Some people self-medicate with alcohol or or cigarettes or ice-cream. I self-medicate with TV. It’s probably not the healthiest of coping mechanisms, but I’m not hung over, my lungs still work, and my clothes still fit despite the fact that I can pretty much feel my metabolism grinding to a halt. In any case, while I’m still walking with a pretty significant hobble, the “rest-cure” seems to be working at least a little. My foot doesn’t hurt as much, and I can get around a little better. Here’s what else I know: I have a doctor whom I trust. Who has not only examined my x-rays but has also taken a full history and treated me for a few years now. He has laid eyes on my actual foot, palpitated the affected areas, and compared the injured foot to the uninjured foot–in person. He has said I need an MRI. I haven’t yet had the MRI. I won’t have it until next week, and I don’t see him again for a few days after that. So until he tells me what I’m dealing with, I wait. While I wait, I try not to panic or go too far down the rabbit holes of various diagnoses. My baseline is much closer to panic than usual. The wind is blowing, figuratively speaking, and I’m holding on to my branch. Initially, I had planned to keep silent about the whole thing. I generally play things like this close to the vest. To say that I don’t like talking about injuries or vulnerabilities might be the understatement of the week month year decade(?). But over the course of the last week, I’ve read a number of posts from other runners dealing with their injuries, and they have helped me. A great deal. It has given me hope to read about other people’s determination, their strength, and their struggles. To watch them make their comebacks against broken bones, torn ligaments, and other injuries. Some of these stories are from professional athletes and #runheroes like Kara Goucher and Caitlyn Comfort. Others are my friends who have conquered sprained ankles, broken bones, diabetes, MS.
I’m trying to stay positive and be patient, sometimes more successfully than others. I’m doing what I can to work on my core, my hips, my glutes (not easy when you can’t flex one of your feet! ), and when I get back from the beach (where I’m visiting my parents), I’ll start more intensive cross-training (hello pool-running) and hopefully get my diagnosis. [Creative Commons licensed image by Flickr user Don McCullough].